Soccer Christmas cards are great holiday cards to send to friends or family members who are soccer's fans. Every guy seem to be a soccer's fan. When the soccer's season is around, each and nearly every one of them is glued to the television set. There's no way that you are able to watch your favourite sitcom when a match is on unless you have another television set in another room. Do you have anyone who's a soccer fan? A brother, a son, or your husband? Make him or them Soccer Christmas greeting cards. They will surely love it. The above 'Holiday Cheer' card is one Christmas greeting card I created for my brother. I used a picture of a football for this holiday greetings. Here's the computer graphic greeting card! Have a look. white cardstock : I used a sheet of white sheen inkjet computer card stock. Print image onto white card-stock. Score a vertical line on the left of the image about half an inch from the edge. Lay the computer printed image on another white card. Trim both cards around the printed image. Apply glue to the edge of the image on the left of the scoreline. Attach to the bottom card. Stamp 'Holiday Cheer' on the centre of the football greeting card with black ink. Check the card image above. You will be able to see a vertical score line at the left of the football. On left of the score line the card is glue to the bottom card but the right can be open just like other greeting card. 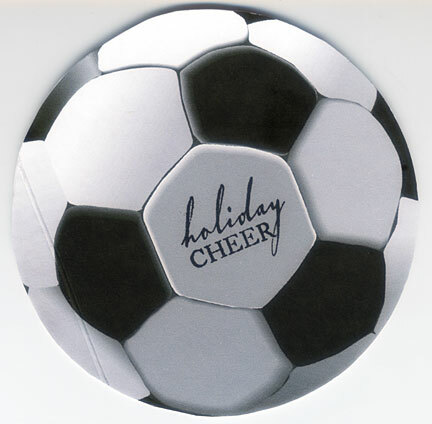 This holiday card has a diameter of 6 inches so a 6.25" X 6.25" square envelope is needed to post this soccer card. This card design can also be used for a birthday card too. Just find a 'Happy Birthday' rubber stamp or use your computer to generate a Birthday message on the image before printing it onto cardstock. You can also change the black part of the ball into red if you prefer a red and white ball. So just modify the image and you have a great handmade greeting card to send for any occasion.